RV refrigerators can fail for a number of reasons. A common problem is when the refrigerator stops cooling properly — especially after it hasn’t been used in awhile. 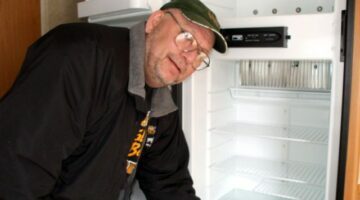 See how to solve a number of RV refrigerator repair issues yourself, online repair manuals for Dometic and Norcold refrigerators, and when it makes sense to replace instead of repair an RV refrigerator. 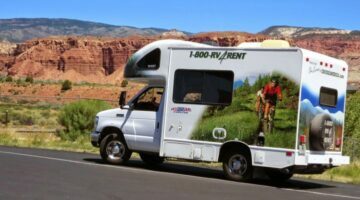 Did you know that you can save money on your taxes if you buy an RV? Yep. Here are all the IRS tax deductions for RV owners. And… if you run your business out of your RV, then the RV tax deduction is even greater! For your DIY RV van conversion, you’ll want to start from the top down. That way, one step won’t interfere with another while constructing your Class B motorhome. First, determine which amenities you want to include. Then, install everything that you plan to have mounted on the roof before you do anything else. 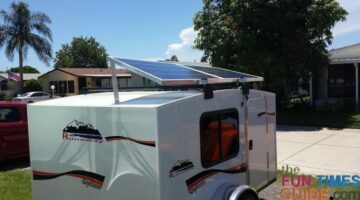 I’ll show you how to install RV solar panels, an RV vent, and a TV antenna on the roof of your RV van. See how I built a Class B motorhome from a cargo van. 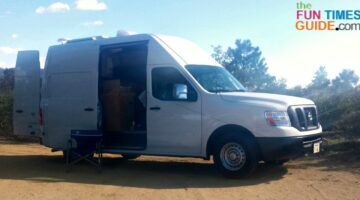 Today, I’m covering the first step in my DIY RV camper van conversion series: How to choose the best cargo van for an RV conversion. Here is a list of all the ways the RV Level 4 beats other RV leveling systems I’ve tried: it’s easier to use, it runs on USB instead of batteries, the app works perfectly without changing the settings on your phone, the calibration switch is better than the others’, it’s more reliable (accurate within 1/10th of an inch), and it’s less expensive. 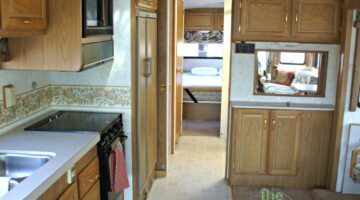 Is it time to remodel your RV? 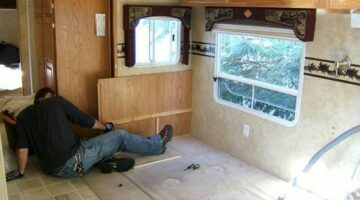 Oh, how I’ve enjoyed remodeling RVs and travel trailers… Here are my best tips doing the RV renovation yourself. Plus where to find RV parts & accessories, and RV renovation companies that will do the work for you if you like. Do you know your state’s triple towing laws (or double towing laws)?… In many states it’s legal to tow 2 trailers at the same time! Here’s a list of states that permit triple towing. 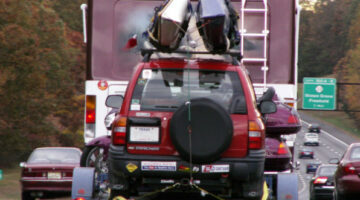 Plus, what you need to know before you pull 2 trailers behind 1 vehicle. 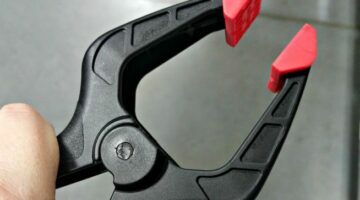 See why I think a cheap set of spring clamps are the RVer’s equivalent to a Swiss army knife. 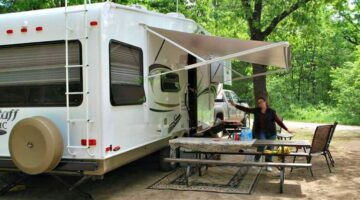 Here’s my list of clever uses for spring clamps while RVing and camping — from making a DIY camper awning to holding curtains open, keeping your dog safe while setting up camp, and drying a few items on a camping clothesline. There are SO many ways to use spring clamps in and around the RV! RV refrigerator not cooling? I can help you find the problem! I’m going to walk you through the steps of DIY RV refrigerator repair. Then, if it still doesn’t work, I’ll let you know when it’s time to throw in the towel and call a professional to fix your RV fridge. Whether you have a Norcold refrigerator, a Dometic refrigerator, or some other RV refrigerator… I can help! Whether you’ve got a rock chip (that will lead to a cracked windshield in no time, or an RV windshield that needs replaced for some other reason. 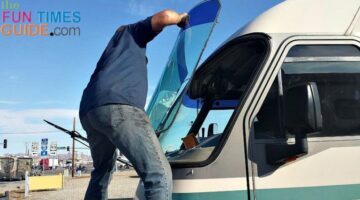 Here’s what I’ve learned firsthand about RV windshield replacement cost vs RV windshield repair cost. The wood door panels on your RV refrigerator expand, contract, and absorb water — because wood is a living, breathing product that changes with the weather. After spending 8 months in the heat & humidity of Florida, when I relocated to the deserts of Arizona for the winter, it took only a few weeks for the wood door panels on my refrigerator to warp! To prevent this from happening to you, be sure to regularly treat all wood surfaces in your RV with an oil-based furniture polish. See how I repaired the warped doors on my RV refrigerator – and you can too. All About Buying & Building Teardrop Campers, Affordable Teardrop Trailer Alternatives, And Where To Rent A Teardrop Trailer In The U.S.
You can buy a teardrop camper that’s ready to go with all the extras, you can roll up your sleeves and build one yourself, or you can rent a teardrop trailer and travel freely. However you do it, there’s no time like the present to get on the road and see everything this country has to offer from the comfort of an RV! I gave up trying to keep my hydraulic leveling system working like it should and converted the HWH hydraulic leveling jacks over to manual controls. So now when I hit the switch, the jack goes down! Here’s how I did it — and you can, too. 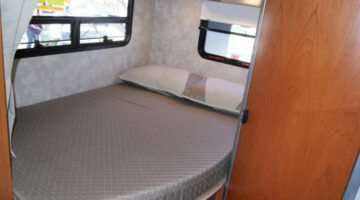 RV Mattress Reviews: The Good, The Bad, And The Ugly! Here’s how to tell what size RV mattress you have now and where to find replacement camper mattresses. Plus my personal experience with several different RV mattresses. TIP: If you can’t afford a new camper mattress, try a memory foam mattress topper! Before you let the salesman at the RV dealership get you into that chair in his office, you should know ahead of time what your trade-in is worth, and what the RV you’re interested in buying is really worth. That way, you will know the bottom line that you are willing to accept before he even starts the routine of going back and forth to the sales manager. Here’s how to determine RV prices and values. With a little planning, your undersized RV kitchen can produce everything for a Thanksgiving dinner that you’ve prepared for past family gatherings. Helpful RV Thanksgiving turkey tips! RV leveling jacks giving you problems? Here’s how to troubleshoot what’s going on. I’ll show you how to find the source of the problem step-by-step and repair your RV levelers yourself! Wondering what other RVers do for Halloween on the road? Here’s what to expect at the RV parks, campgrounds, and resorts – a fun Halloween guide for RVers. 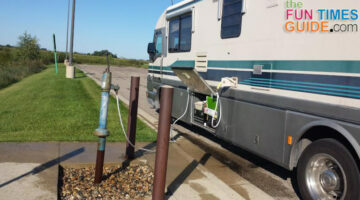 Replacing the waste valve assembly is a low-cost DIY project that any RV owner can do easily. Here’s how to do it – step by step, with photos and videos. When you’re boondocking, it’s much more convenient to get your power from RV solar panels, instead of running the RV generator all the time! The LevelMatePRO is the best way I’ve found to accurately determine if your RV is level. Here’s my review of this handy Bluetooth RV leveling system.